Staying in London this weekend to make the most of the fact that half its population isn’t? 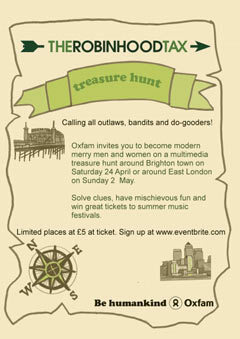 If so, you could do far worse than head down to the Rich Mix on Sunday at 1pm for Oxfam’s Robin Hood Tax Treasure Hunt. Katy Wright of Oxfam tells us, "Participants will need to use all their creative skills to produce photos, videos and online content to complete all the tasks, including dressing up as a banker in a charity shop and interviewing people in the street. Not only is the activity lots of fun but it will help us to deliver a strong and visual message to local politicians, demonstrating support for the Robin Hood Tax". Not heard of that? We hadn’t either. They are proposing an average 0.05% tax to be levied on bank to bank transactions. Countries would keep 50% of the proceeds to address domestic poverty, with the other 50% split between helping countries abroad reduce poverty and adapt to the effects of climate change. In the UK, the money could be used to avoid cuts to vital public services and for a range of good causes such as meeting the government's target to halve child poverty and protecting schools and hospitals. Tickets are just £2. Further goodness: not only will you be doing a lovely thing by giving Oxfam a wee bit of your money, you could win festival tickets to Latitude and Winterwell festival! If you go be sure to let us know how you get on and send in your pics. Find out more about Oxfam's Robin Hood Tax campaign online.